As a child, I would pretend that broccoli florets were little green (summertime) trees and cauliflower florets were little trees covered with snow. Me being a giant or a big scary dinosaur overlooking all the tiny trees, I would pick one up and chomp off the poofy tops before polishing off the stems. “Goodbye, little trees. You sure were tasty.” Just to note: I love the environment. Lucky for my parents, I had a hearty, adventurous palate and I would try almost all foods growing up… even "gross" vegetables. Just as long as I got to play with my food. For this recipe, I decided to keep it nice and simple using white cauliflower as the basis of this quick to prepare sheet pan side dish. All the ingredients required for this delish recipe. Amounts and ingredients listed below. Toss the cauliflower with the oil and spices before roasting. Not only does cauliflower have a fun shape (woo hoo fractals), but it has awesome health benefits. It is a good source of vitamins and nutrients including as vitamins C, K, and folate. For the spices, I decided to use the combination of smoked paprika, turmeric, and cumin along with a few red pepper flakes for a little more heat. As it roasts, the spices permeate into the cauliflower giving it not only delicious spiced flavours, but a lovely golden orange colour. Each tender floret gets a wonderful slight brown char on its surface, which I think is the best part of any roasted vegetable. 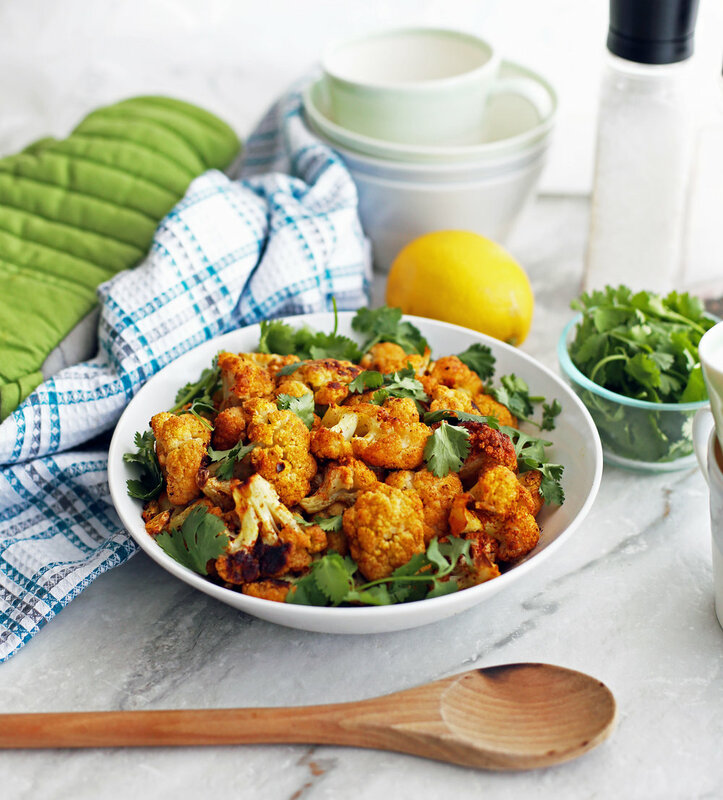 As soon as the cauliflower is removed from the oven, squeeze a little bit of fresh lemon juice over the top. The acidity from the lemon compliments the spices (it cuts the heat slightly too) and adds a lovely fresh and zesty note to this side dish. The final touch is a sprinkling of fresh cilantro (aka coriander) on top. I love the taste of cilantro. To me, it has a bright, kind of lemony, unique taste that goes so well with spicy flavours. On the other hand, I know that others have described it as tasting like soap or metal so it is a definite no-go for them. Substitute with parsley if you are in the latter category. Do you like cilantro? Overall, this dish is mildly spicy. Just enough to warm you up on the inside. If you like it really spicy, I suggest that you up the spice level to suit your needs. Plus, it just happens to be vegan and gluten-free too. I like to eat it right away, but it re-heats well so it would be great for meal prep or as leftovers. I hope you enjoy this recipe. Preheat the oven to 450 degrees F. Place the cauliflower florets on a baking sheet (lined with aluminum foil for easy clean-up). Toss the cauliflower with the olive oil and spices (including salt and pepper) until the cauliflower is well coated. Roast for 25-30 minutes, flipping the cauliflower halfway, until browned and tender. After removing the cauliflower from the oven, top with lemon juice and cilantro. Season with additional salt and pepper if you like. Best served immediately.